By using the Wärtsilä JOVYREC THYRIDIN rectifiers in combination with batteries uninterruptible DC power supply (UPS systems / DC-UPS systems) can be ensured. These thyristor-controlled rectifiers with parallel-connected batteries are necessary to protect electrical DC consumers with higher performances against the consequences of grid failure. Lead as well as nickel-cadmium batteries can serve as energy storage systems. The rectifiers offer a high amount of reliability and dispose of a vast monitoring concept. The electronic control of the output voltage functions according to the IU characteristic in accordance with DIN 417773 and therefore provides efficient and gentle loading of the connected batteries. Further characteristics as IUI, IUU, IUU/T etc. are programmable. 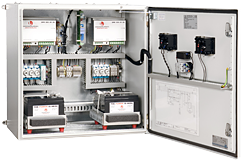 Application areas for DC UPS systems with thyristor technology are: transformer stations, power plants, oil and gas industries as well as shipping and rail transport. In the rectifiers of the Wärtsilä JOVYREC THYRIDIN generally rectifier bridges in B6C circuits are applied. Optionally also rectifiers with fully controlled 12-pulse rectifier bridges can be provided for specific applications. The control board AT90 is the heart of the thyristor control, an AVR microcontroller with ISP flash and CAN controller. All control and signal interfaces important for rectifier operation as well as a RS 232 interface for the connection of an external computer are made available on the controller board. The LCD panel of Wärtsilä JOVYREC THYRIDIN rectifiers enable simple setting of all measurement values. All operating parameters are clearly and user-friendly indicated. Additionally various warn and fault messages as well as battery operation are notified via LEDs. As a standard the following messages are available via potential-free contacts and LED messages: collective alarm, battery operation, battery under voltage, rectifier on, battery operation. Optionally a series of additional messages and monitoring via additional LEDs or relay cards are feasible, e.g. manual switch to emergency operation, manual temperature adjustment via panel, compensation of voltage drop in the load line, parallel operation for performance increase up to maximum three devices etc. We gladly advise you about the multiple options.